We sing at 57:12 "The Prayer" from our new album INNER SANCTUM. And at 71:55 We sing a little medley of two old Billy Graham favorites, "What a Friend we Have in jesus" and "Blessed Assurance". I don't know how long the video will stay there on their site, so if you want to watch it, you might need to go ahead and do that. You can see my hands shaking! I just finished reading my very first GERMAN book all the way through from front to back!!! Yes, folks, it has taken me more than 20 years to finally tackle a novel in German. 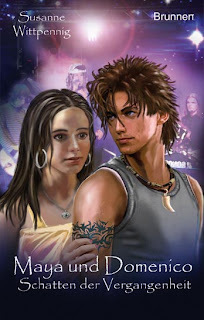 The novel in question is the 5th in a series of youth novels about a young couple, Maya and Domenico. "Schatten der Vergangenheit". Shadow of the Past. Do you know what a youth novel is? It's a story that is written in a style and about situations that youth- in this case 17 to 18- year old young people, can relate to. Since I haven't read the first 4 books in the series, I don't know the history of this young couple. But in this book, Domenico, a chain-smoking, drug-using, rehab-jumping, hot-blooded hunk, wants to find his father, an Olympic gold-medal winning athlete who lives in Norway. He is accompanied by his long-time girlfriend, Maya. She is a good and generous girl who could be a poster girl for "Women Who Love Too Much". But, hey, they complete each other. She needs him to take care of, and he needs her to take care of him. So, they make a slightly dysfunctional entity ready to take on all the problems that the world throws at this age of teens. Yes, I read the whole book! All by myself and without a dictionary. So, I think that means that I now have the functioning vocabulary of a 17-year old German. You may wonder why I chose this as my first ever novel in German. The answer is simple. I am in the book!!!! A while later, he informed me that he had played the song for the author of the book, Susanne Wittpennig and she found that it fit the story she was writing so well that she wanted to incorporate it into the action. While Domenico is in Norway, he discovers he has a musical half-brother who just happens to be a Christian, and they become very close. This half-brother plays "Flügel" for Maya and Domenico while they read the lyrics which are actually printed on page 248. And they compliment the singer (that would be me). At the end of the book, there is even a page about me, with a link to my homepage and to this blog! I must admit, it was the search for my song and my name that made me start reading the book. But I eventually got sucked into the drama and couldn't put it down. And now? Will Maya and Domenico find a way to stay together? Will Maya be a help to her father and mother, who has been diagnosed with cancer? Will Domenico stay in contact with his new found family? Stay tuned for Volume 6 of the Maya and Domenico saga. zunächst einmal persönlich herzlichen Dank für Euren Beitrag. Ich habe ihn im Ü-Wagen genossen. Es war super! Die Gala wird voraussichtlich am Wochenende ins Netz gestellt; im Fernsehen wird sie zunächst am kommenden Sonntag um 15:00 Uhr wiederholt und dann auch nochmals am 31. Dezember um 17:10 Uhr (jeweils auf ERF eins). The ERF Gala will be put on the internet this coming weekend. You can watch it on television on the ERF 1 TV station this Sunday, November 1 at 3 PM (15.00) and again on December 31 at 5:10 PM (17.10). It has been a long time since my hands shook so hard from being nervous that I couldn't hold a glass of water still enough to sip from it. But that was the case last Sunday. I've been trying to figure out why this particular performance made us both (me and Eddie) so nervous. We knew there was a lot riding on it. We sang for the ERF 50th Anniversary Gala on Sunday. And we knew that the Rittal Arena was sold out (about 5000 people) and that the program was to be shown live on television. We also knew that we had one chance in front of a big audience like this to introduce our new album, "Inner Sanctum". So we wanted to do the best job we possible could. We also knew that there would be a lot of colleagues there that we haven't seen in years and even decades. So, we wanted to look our best, too. All of that, we knew. What we didn't know was that on Saturday, after getting up at 6:30 AM and driving to Wetzlar to be awake and dressed for the show and ready to sing for the camera rehearsal, we would find - well, - pretty much -chaos. We tried to stay upbeat and see the humorous side of it all. After all, it was, for everyone involved, an exceptional situation. For the camera crew, for the orchestra, for the sound people, the teen choir, the speakers , the musicians, the performers and last but not least the soloists. And for all the people behind the scene. And of course, for ERF. We were in our places on the stage at 10:30, were informed that our sound check would be moved to 12:15 and finally got to check our microphones at 4:45. Thank goodness we brought Peter Falke, our super duper sound guy with us. After he left, I brushed my hair and was ready to go to breakfast at 10:00, just as planned. But I sat down in the room and read another chapter of my book and then leisurely found my way down to the breakfast room where several other late eaters were enjoying their meals in the sunny breakfast room with lots of coffee and laughter. After enjoying their highly -preferable company I joined old grumpy Eddie. He apologized by squeezing fresh orange juice for me. Sometimes actions speak louder than words. By the end of breakfast, we were all laughing together and looking forward to the day. Ingo Marx, an ERF writer, had told us the day before that the chaos just simply gave the Holy Spirit more room to work. And it seems that his philosophy is true! Because everything, and I do mean everything, went so smoothly and harmoniously and beautifully for the Gala Show that we just had our socks blessed off! I've since been informed that nobody watching the program on TV could actually see my legs shaking, even though I was sure they would. Eddie and I were able to find our loving harmony in time to share that with the audience. The ERF people were so pleased and our Gerth Media record folks were pleased and colleagues were pleased and we were pleased and most most most important, we felt that the Lord was pleased with our offering. And we pray that listeners were moved, as we were, by how our chaos can result in a thing of beauty. Definitely not summer any more. 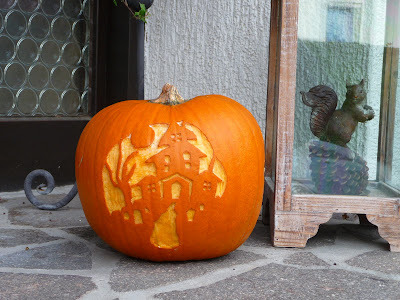 Do you like our pumpkin? :) Luke and I cut the picture into the pumpkin using the Dremel tool. When we were done the entire kitchen was covered in pumpkin juice. As were our clothes and glasses. And hair and faces. Tomorrow (Sunday) I have a concert in the industrial area of Germany: Remscheid. I have so few concerts in that area! So we're excited. We? That's Cae, yes. Florian, yes. Luke, yes. Peter, yes. Eddie, no! Eddie is in South Korea with his opera house performing "Der Freischutz". The soloists are all from the opera house here, but the choir and orchestra are Korean. And they're performing in German. Eddie and I Skype every day and he says that is quite enjoyable working with the Koreans. They are so polite and well-prepared. He's enjoying discovering the town of Daegu. Not Seoul. Daegu. A big, very industrial city about 5 hours from Seoul that most westerners have never heard of. The interviews have begun that are an important part of releasing a new album. So I've been busy collecting my thoughts, opinions, and impressions of our new album, "Inner Sanctum" so that I can answer the questions that come up. And Marion Sitzmann, Florian's wife, is writing a German translation of the 3 English songs on the album so that everyone knows what we're singing about. She came by yesterday to discuss some of the finer points of her translations. She is one smart lady! We'll have the booklet graphics finished by the end of next week. The master is finished and ready to be pressed. Oooohh, things are well on their way to being a final product I can hold in my hand. Winter weather and a trip to IKEA has produced a pair of down-filled- house- shoe-feet-warmers that are DIVINE! Last night, as I sat in my "creative chair" making a Lifeline, I slipped those babies on and within a couple of minutes, my feet were toasty warm! It's just an added bonus that they are bright red. Just the sight of them helps warm my feet which are busy telling me that it is most definitely not summer any more. In fact, it's been getting down to freezing for the last 5 nights. I've brought the house plants back into the house and taken the candles out of the cabinet. Time for hot tea and candles in the evenings while I make your Lifelines! I want to be sure and have plenty of them to offer at our Christmas concerts, which will be here before you know it. 18 years ago, my parents came to visit us here in Germany. During their time here, we took them to Triberg. And they wanted to stop and take a look in the store, "House of 1000 clocks". So, we did, and my Mom and Dad fell in love with a massive and beautiful grandfather clock. They bought it and paid to have it shipped to their home in Texas, then moved it to Arkansas and now to Virginia where it lives in my sister's house. Last week, my sis accidently broke one of the weights that is pulled to wind the clock. Looking for a repair or replacement, I phoned the "House of 1000 clocks". Imagine my astonishment when the lady on the other end, Rebecca Weisser, the wife of the owner, turned out to be American, and a fan! We talked for a long time and it turns out they have a repair station in the States. So, problem solved, lovely new acquaintance gained and we will definitely be visiting Triberg in the near future. Maybe between Christmas and New Year when they have their Triberger Christmas Magic Days. I know, it's only October. But we will have a crowd here visiting us that week and we're already collecting ideas for activities for the crowd. Must keep the young ones busy!